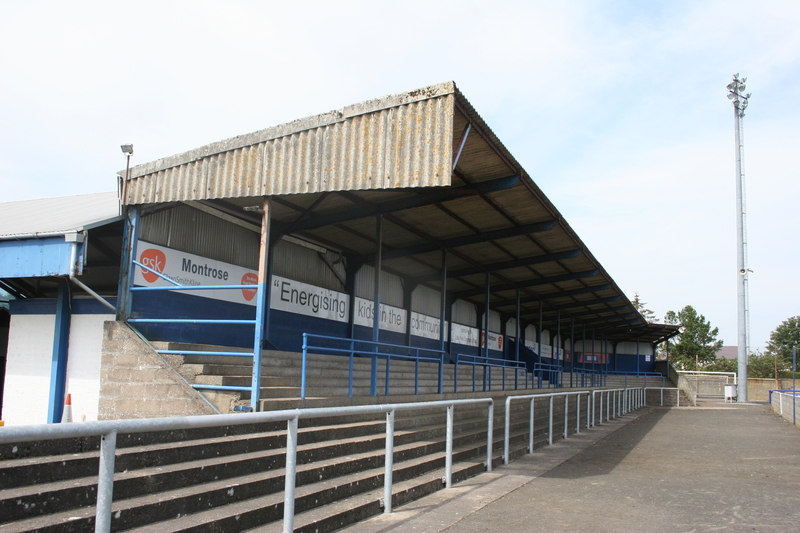 Montrose FC were formed in 1879 and initially played on the local golf links before moving to the original Links Park. 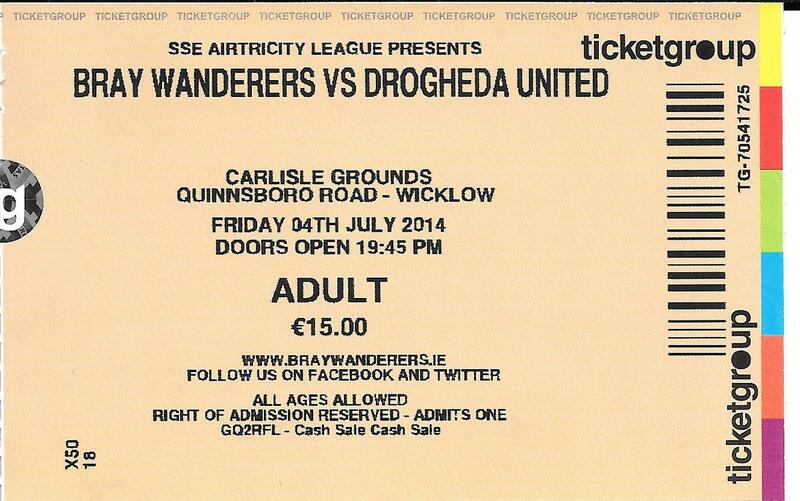 This venue was close to the current ground on Dorward Road. This venue had very spartan facilities and the club hankered after its own ground. In 1887 the club obtained the site in Wellington Street now known as Links Park having raised capital by hiring out their old pitch to travelling circuses and for grazing animals. While the new venue was certainly a step up for the club, being enclosed meant admission charges could be levied, it was still fairly rudimentary. It wasn’t until 1920 that Links Park had any form of spectator accommodation when a small wooden grandstand was acquired from the a local Highland Games venue for a princely sum of £150. Soon after the ground improvements Montrose were elected as founder members if the new Scottish League Third Division for the 1923/4 season. Joining them in the 16 team competition were near neighbours Brechin City. In fact aside from these two only two other founder members remain in League membership, these being East Stirlingshire and Queen of the South. Long gone are the likes of Clackmannan, Helensburgh, Dumbarton Harp, Galston and Solway Star. 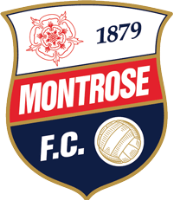 Montrose finished fourth in that inaugural campaign although the competition itself would only last a further two season before being disbanded due to the financial hardships suffered by most of the member teams. For the 1929/30 season Montrose were re-elected to the Scottish League as members of the Second Division. One of the clubs’ finest hours came in 1938/39 when they knocked reigning Scottish Cup holders East Fife out of the competition, thumping the men from Methil 9-1 on their own Bayview Park pitch. A great day indeed for the Gable Endies of Montrose, a nickname derived from the heyday of the town as a working port. The rich merchants and sea captains would augment their already ostentatious homes with a gable on the roof which would face the street as if to advertise their wealth and status, hence the name “Gable Endies”. 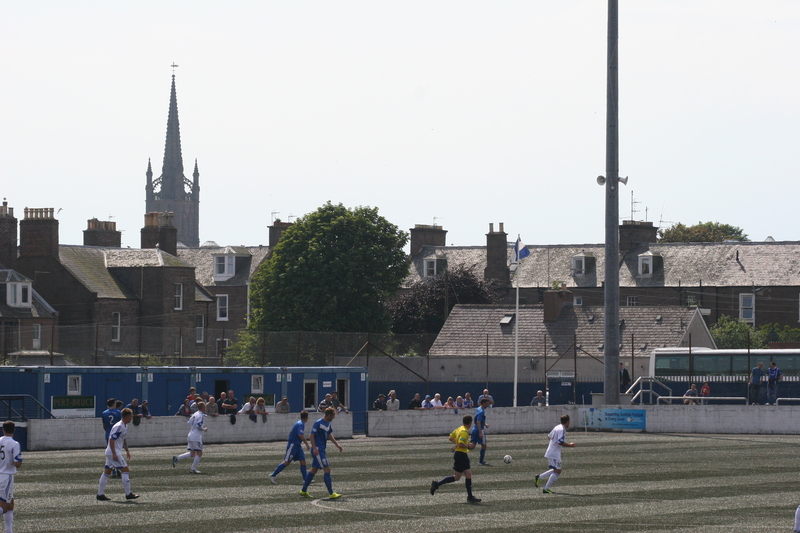 Links Park was further enhanced in the 1960’s when the Wellington Street end was covered with an unusual stand that was cranked at the far end. 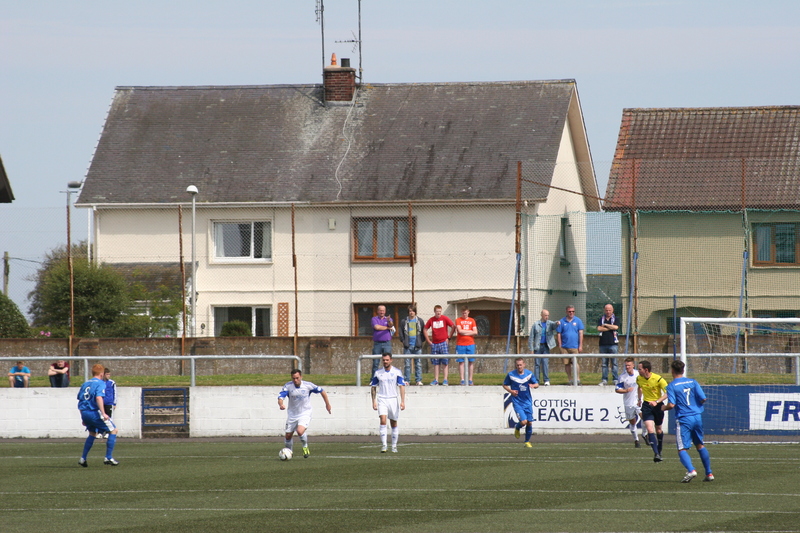 Links Park remained relatively untouched until the modern era when improvements have transformed the venue. 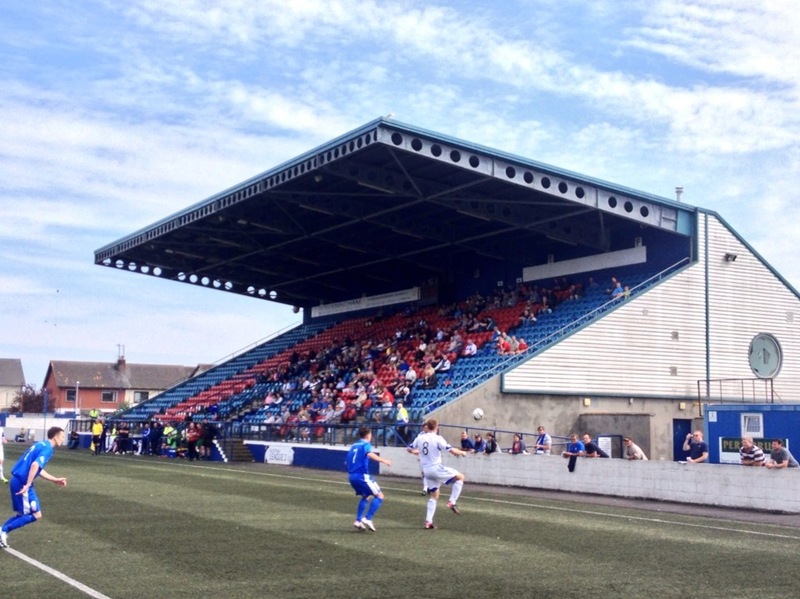 A new 1,300 seater grandstand came first in the late 1995 followed by a 3G pitch laid in 2007 thanks to a £250,000 grant from GlaxoSmithKline. 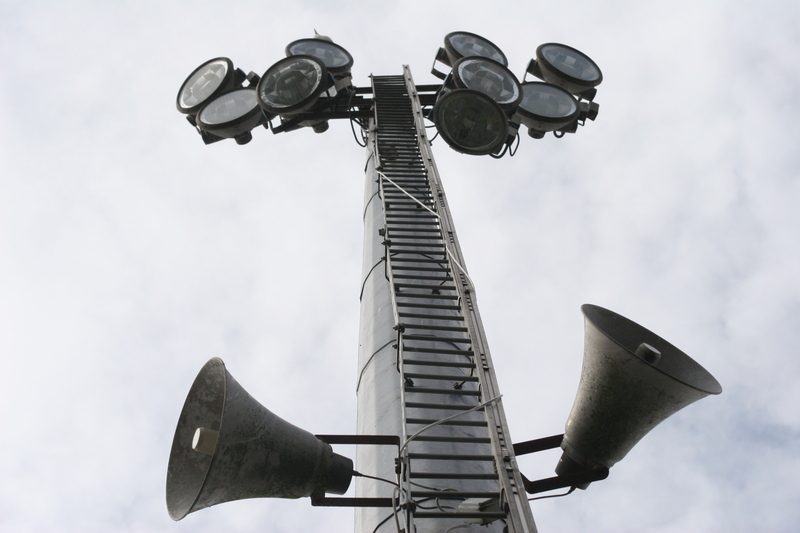 Links Park also boasts natty modern floodlights with a unusual circular configuration of lamps. These replaced the old set of pylons which had stood since 1971. Aside from a few brief stints in the second tier, notably in the 1970’s, the Gable Endies have been used to life in the lower tiers of the Scottish League. In fact the club now begin their 19th straight season in the bottom tier and on the evidence of today it might be another long season of struggle for them. 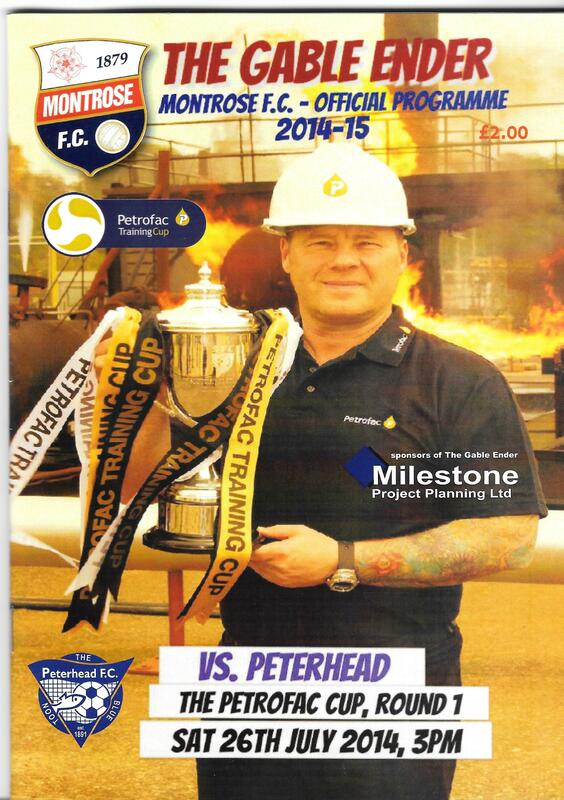 Today’s visitors are Peterhead now of Division One following play off success last season. 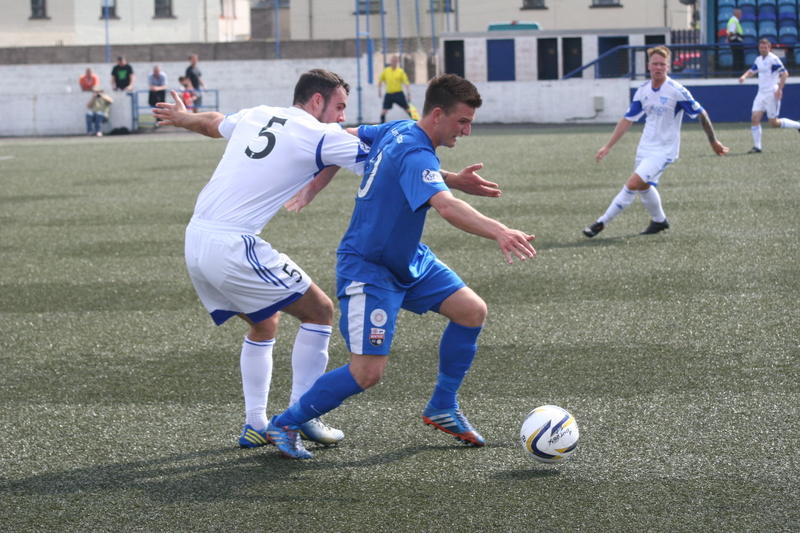 Peterhead race into a three goal lead inside half an hour. If this League Cup wasn’t already over after that, the hosts ensured their own demise when both Graham Webster and Garry Wood were red carded for overly robust challenges. The final whistle was greeted with much gnashing of teeth and head shaking by the majority of the 347 hardy souls in attendance. It seemed scarcely conceivable that this compact little stadium once shoehorned nearly 9,000 people into its confines for a Scottish Cup quarter final with Dundee. But then again they were undoubtedly better days for the Gable Endies. 1. Stuart McKenzie; 2. Graham Webster; 3. Craig Bell; 4. Steven Robb; 5. Ross Graham; 6. Alan Campbell; 7. Stephen O’Neill; 8. Ross McCord; 9. Garry Wood; 10. Scott Johnson; 11. Paul Watson. Subs: 12. Terry Masson (for 7,62 mins); 14. Danny Cavanagh (for 4,77 mins); 15. Bryan Deasley (for 10,83 mins); 16. Stephen Day; 17. Kieran Sturrock. 1. Graeme Smith; 2. Graeme Sharp; 3. Steven Noble; 4. Ross Smith; 5. Scott Ross; 6. Reece Donaldson; 7. Andy Rodgers; 8. Jamie Redman; 9. Rory McAllister; 10. James Stevenson; 11. Ryan Strachan. 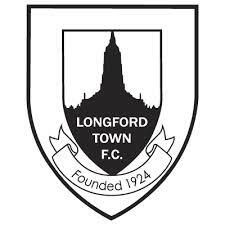 Longford Town were formed at a meeting convened in the town’s Temperance Hall in 1924. The set up kitty totalled £24 and a kit of red and black was agreed in deference to the mighty Bohemian club in Dublin. Initial games were played at Longford Park which was the prelude to a somewhat nomadic existence. 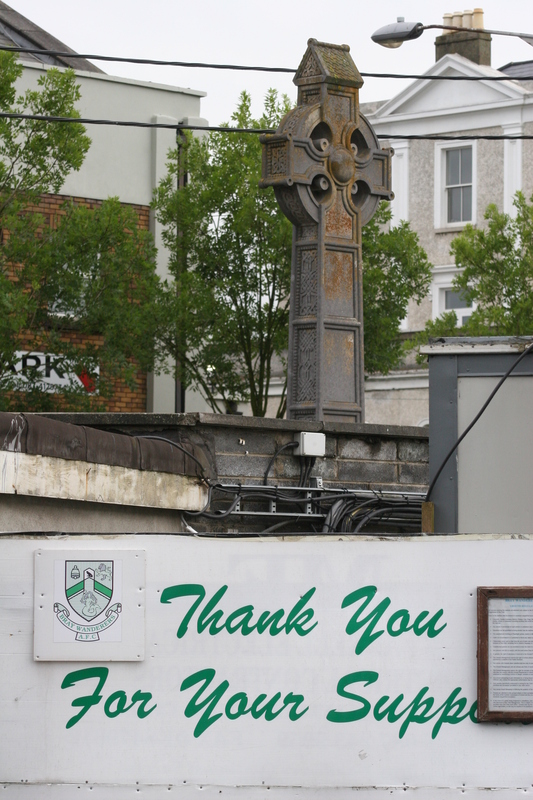 The town of Longford itself is a quiet Midland town with no great pretensions. Its wonderful neo-classical Cathedral is under renovation following a devastating fire in 2009. 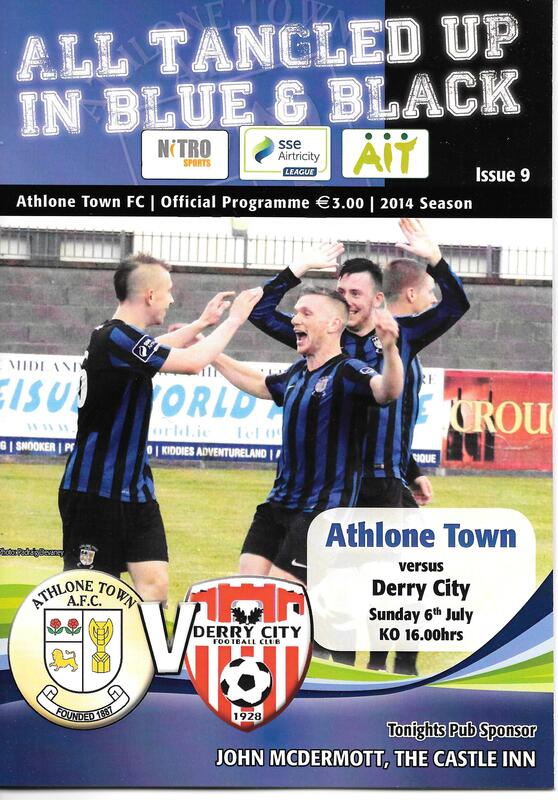 Their derby matches with Midland rivals Athlone Town are among the fiercest in the country. After Longford Park the club used the local greyhound stadium in Park Road until the early 1970’s before a brief stint at a ground in Water Street. The next move was to Abbeycarton which was home until 1993. 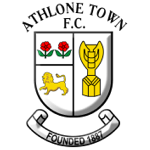 During this time the club were elected to the League of Ireland in 1984. The competition expanded to two divisions the following season and the Reds found themselves relegated to the new Division One. The club were then offered a patch of land three miles west of town on the Strokestown Road. The ground was initially called Mullogher but when it caused confusion with visiting clubs the name of Strokestown Road was adopted. 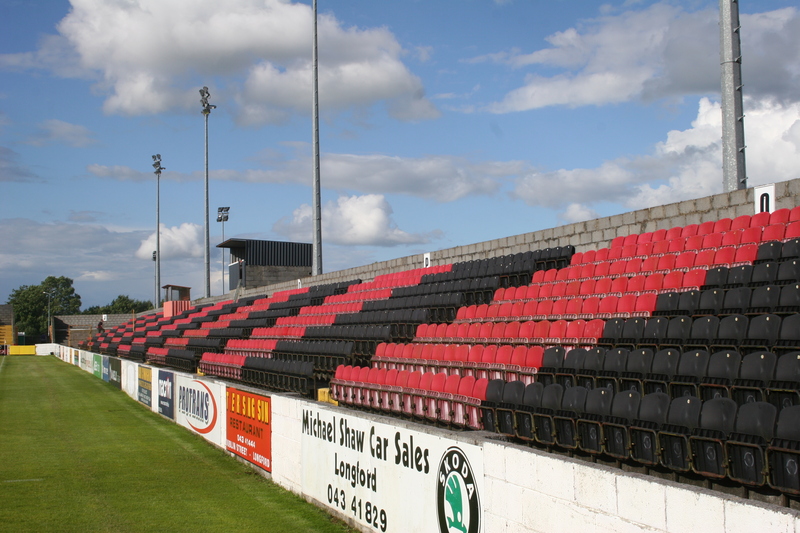 Subsequently the stadium has been sponsored, a long term deal with logistics company Flancare saw locals calling the venue the “Flan Siro” for a period. It is currently known as the City Calling Stadium. Initially the stadium had a small covered terrace adjacent to the clubhouse and a small cover at the top of the bank. 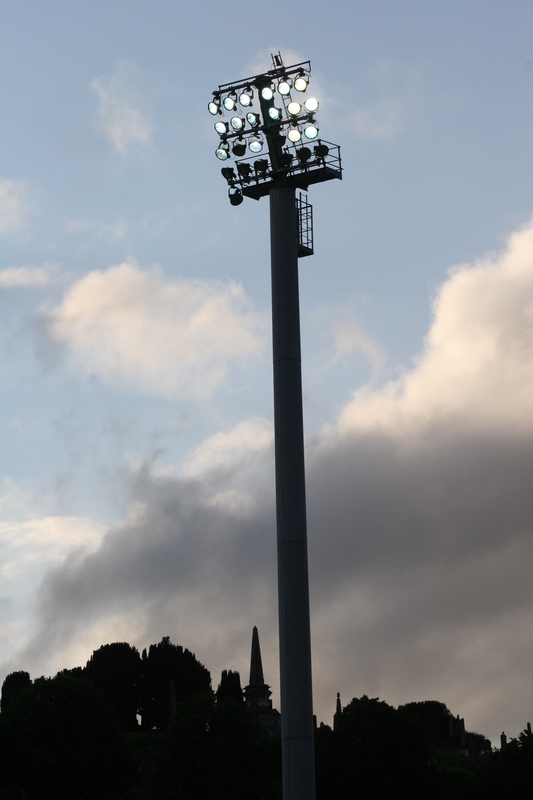 Three small covered stands were then installed on the far side of the ground. 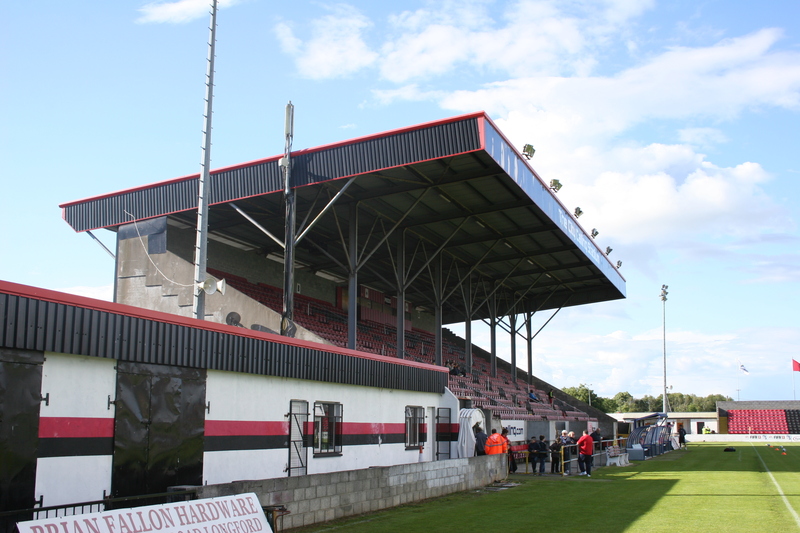 It remained a modest ground until the end of the 2000/01 season when assisted by Government and FAI grants Mullogher was transformed into an all seated stadium with a big elevated grandstand. This lofty structure affords fantastic views of the rural land between Mullogher and the edge of town. Despite its relatively recent vintage the stand behind the south goal is currently cordoned off with broken seats and eroded concrete. The current capacity is just shy of 7,000. The club’s honours lists includes two back-to-back FAI Cup wins in 2003 and 2004 defeating St.Patricks (2-0) and Waterford United (2-1) respectively. In this decade the club qualified for the UEFA Cup on three occasions but went out at the preliminary round stage on each occasion. 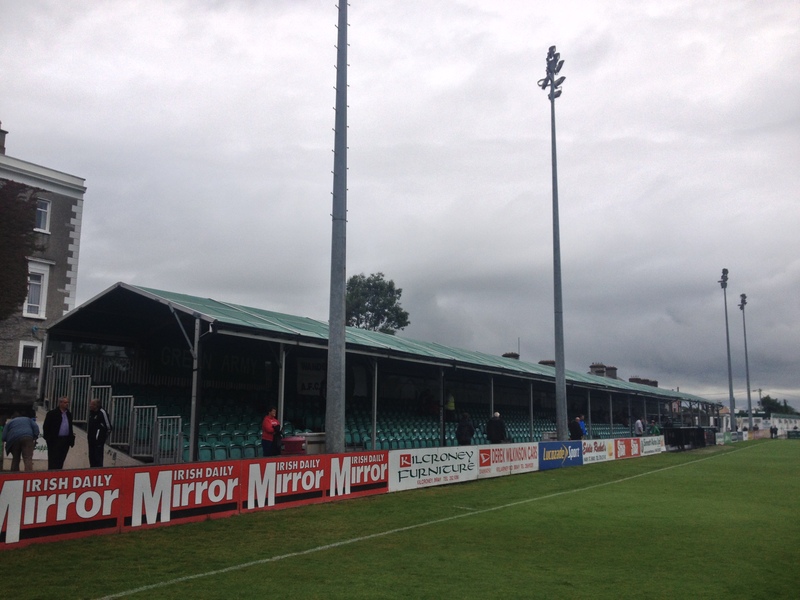 Liteks Lovich (2001), FC Vaduz (2004) and Carmarthen Town (2005) all pitched up to this quiet part of central Ireland. 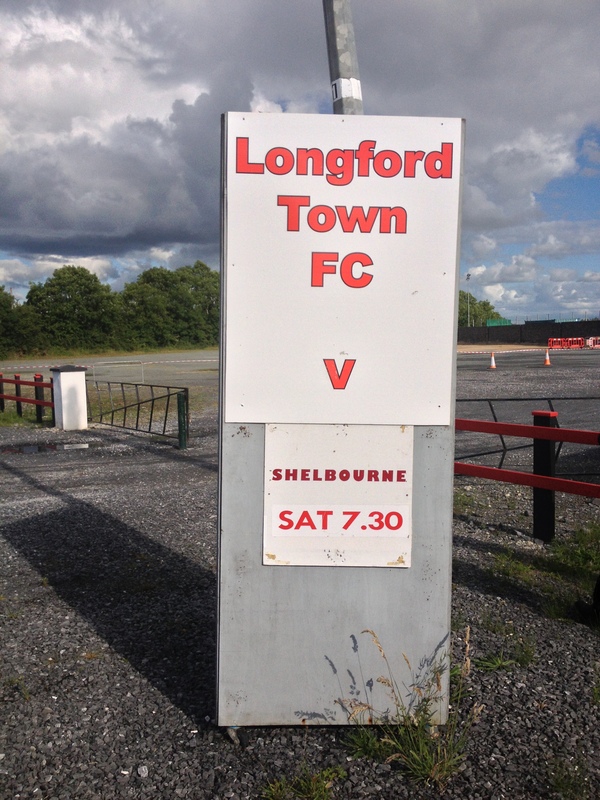 Tonight’s game is a big deal, fallen giants Shelbourne lead the table with Longford just behind but with a game in hand. 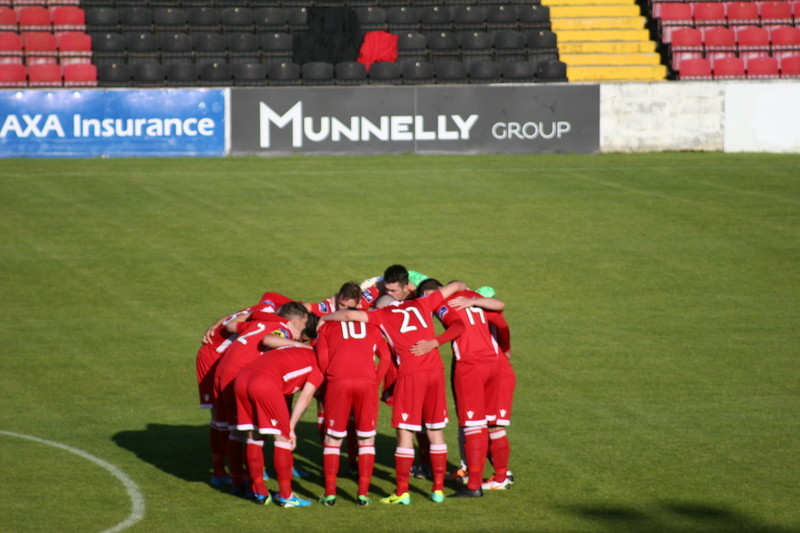 The first half is a tense affair with few chances, it is halted for a little over eight minutes while a severe head injury to Adam O’Connor of Shelbourne was dealt with following a clash of heads with his own team mate, Jake Donnelly. The second half though sees the hosts take charge, the prolific Davy O’Sullivan opened the scoring just after the hour before both sides were reduced to ten men. Ben O’Connor of Longford went for a forceful but seemingly well timed challenge before in the ensuing melee, Shels’ William McDonagh injudiciously threw a punch to earn himself an early exit. Longford’s impressive striker Gary Shaw notched the vital second before O’Sullivan sealed an emphatic win for the hosts. Longford finished third in the First Division in 2012 and second a year later but lost the play off final to Bray Wanderers over two legs. On tonight’s imperious showing this year could well for “De Town”. 18. Paul Hunt; 3. Ben O’Connor; 6. Stephen Rice; 8. Mark Salmon (c); 10. Gary Shaw; 11. Kevin O’Connor; 14. Pat Sullivan; 15. David O’Sullivan; 16. Jamie Mulhall; 17. Don Cowan; 20. Pat Flynn. Subs: 2. Noel Haverty; 5. William Tyrell (for 17,65 mins); 7. Lorcan Shannon (10-84); 9. Peter Hynes (for 15,82 mins); 19. Etanda Nkololo; 24. Rhys Gorman; 1. Chris Bennion. 12. Gregg Murray; 2. Brian Gannon (c); 3. Philip Hand; 4. Adam O’Connor; 7. Conor Murphy; 10. Jordan Keegan; 14. Jake Donnelly; 16. Dylan Connolly; 18. Lee Desmond; 21. Dylan Cashin; 28. William McDonagh. Subs: 33. Nathan Murphy; 17. Gareth Coughlin; 9. Lee Duffy (for 3,82 mins); 23. Simon Dixon (for 2,56 mins); 26. Ryan Robinson (for 4,34 mins); 19. Matthew Taylor; 6. Gareth Brady. 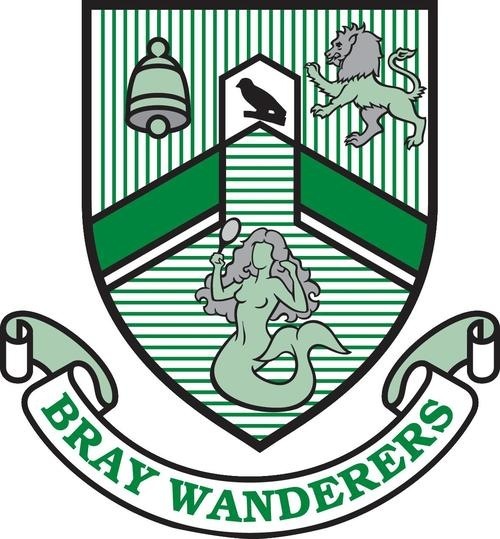 Bray Wanderers were reformed in 1942 and have only been League of Ireland members for thirty years or so since the competition was expanded to two divisions. 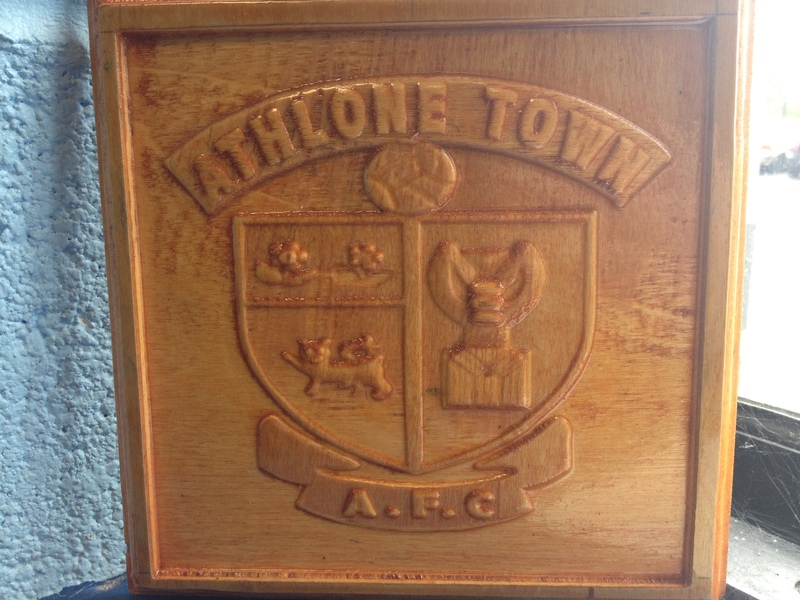 Prior to that they played in the Athletic Union League and later still the Leinster Senior League. The club had originally been formed in 1922 out of St.Kevin’s GAA club but failed to hit the the heights and folded after ten years. Part of the problem was the town already had a pre-eminent team. I have always like the self deprecating name of the club, Bray Unknowns. They had been elected to the League of Ireland in 1924 playing at Woodbrook in south Dublin before returning to Bray to play at the Carlisle Grounds. 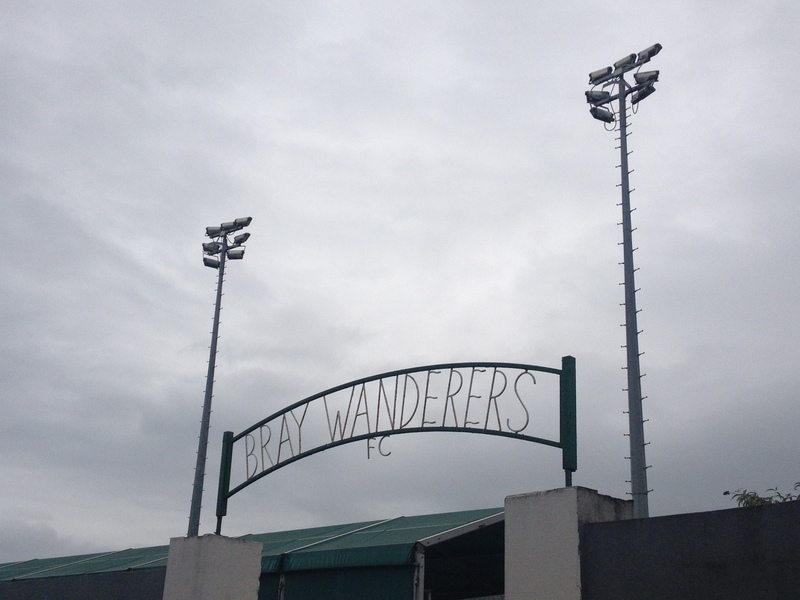 The Unknowns dropped into the Leinster Senior League at the end of the 1942/43 season, prompting the hasty reformation of the dormant Wanderers club. 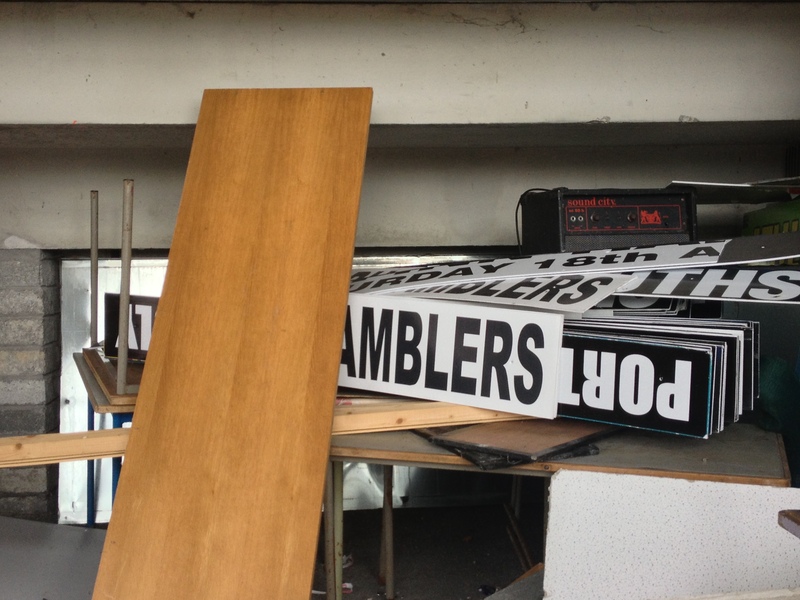 By 1973 the Unknowns were flagging badly and the two clubs joined forces under the Wanderers name. Upon the expansion of the League of Ireland in 1985/86 Bray were elected to the new First Division and promptly won it at the first attempt. They won the FAI Cup in 1990 defeating then non-leaguers St.Francis, becoming the first second tier side to lift the trophy. 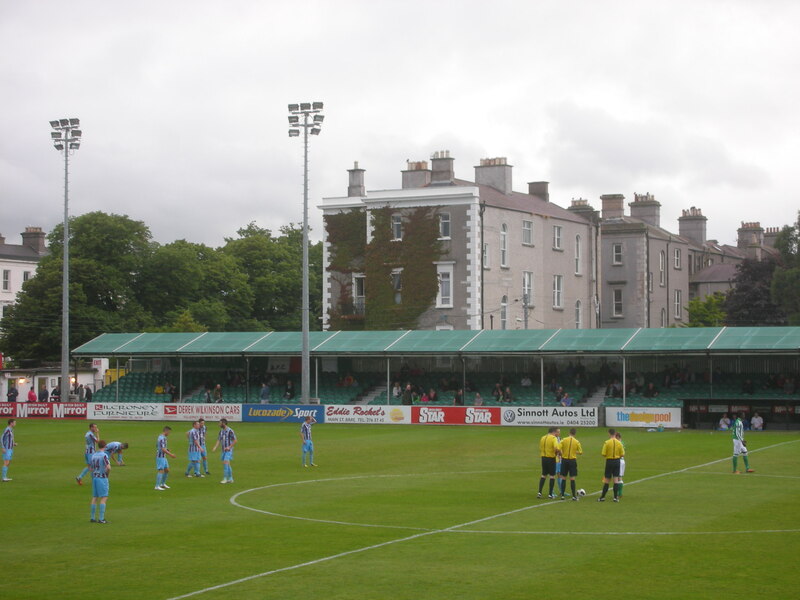 This meant European Cup Winners Cup football came to the Carlisle Grounds the following season but the Seagulls fell at the preliminary round stage having been handed a tough draw against the Turkish side Trabzonspor. The club won the Cup again in 1999 defeating Finn Harps in the final. Wanderers have also won the First Division title twice more in 1995/96 and 1999/2000. They have been runners up a further three times highlighting the yo-yo nature of their existence. 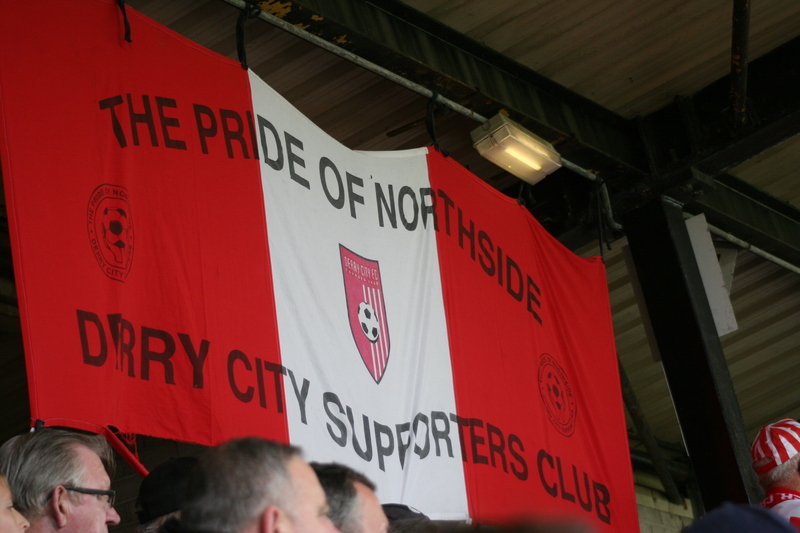 The club should have been relegated in 2009 but retained their top flight place when Cork City imploded. The club have remained in the Premier Division ever since. 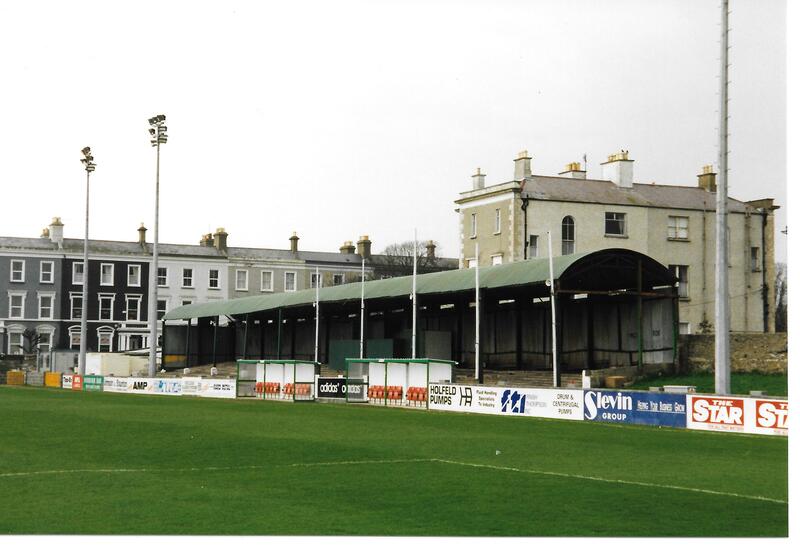 I first visited Bray in March 1998 and the Carlisle Grounds still had one of a pair of old barrelled roof stands as seen in the last picture of the gallery below. It’s companion stand on the other side had just been demolished and seats were being installed. The venue now boasts over 3,000 seats with a tarpaulin covered stand replacing the ageing barrelled roofed terrace in 2006. 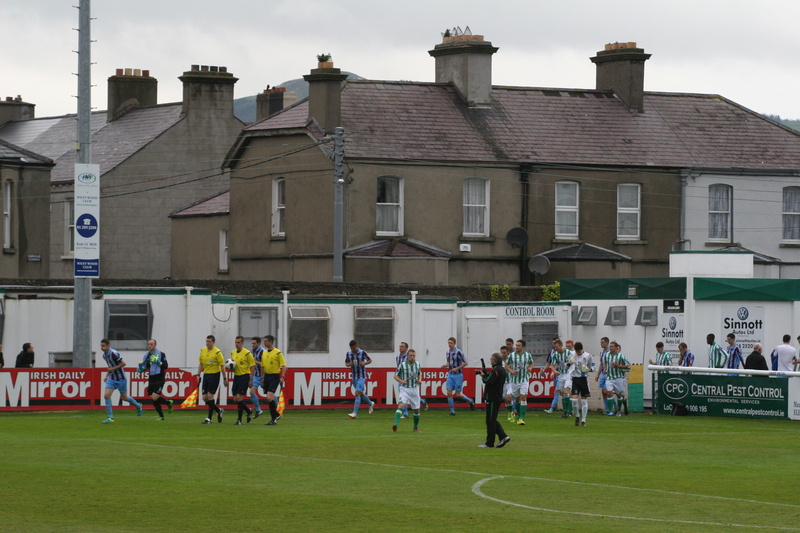 The Carlisle Grounds however pre date any other ground in the League of Ireland. Opened in 1862 as the Bray Athletic Ground it was renamed as the Carlisle Cricket and Archery Ground later that year when it was officially opened by the 7th Earl of Carlisle. Aside from the two Bray clubs the venue also hosted Dublin club Transport FC for three seasons from 1948 before they returned to the capital and a stint at Harold’s Cross Stadium. The Carlisle Grounds also had its own Hollywood moment when it was used for scenes in the 1996 film Michael Collins which starred Liam Neeson. 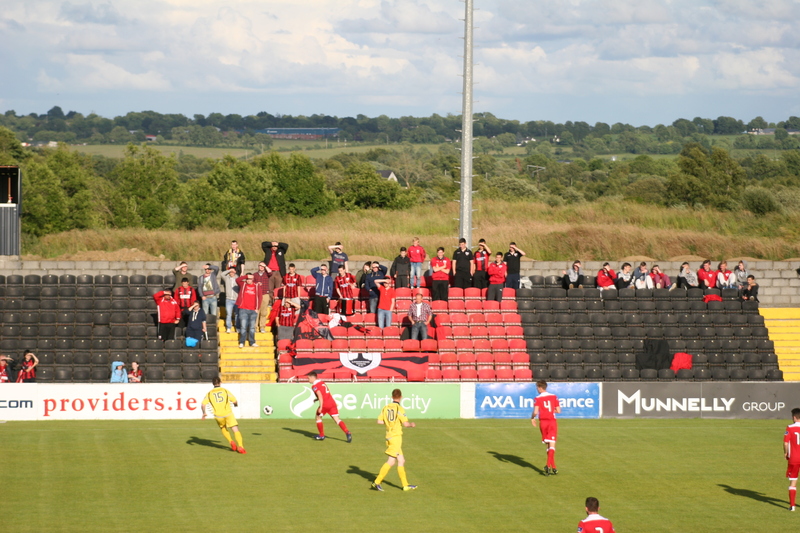 However, the ground had some negative press in 2009 and 2010 when perimeter walls collapsed during matches against Shamrock Rovers and Monaghan United. Around this time the club unveiled bold plans to redevelop the whole ground although this has yet to see the light of day. 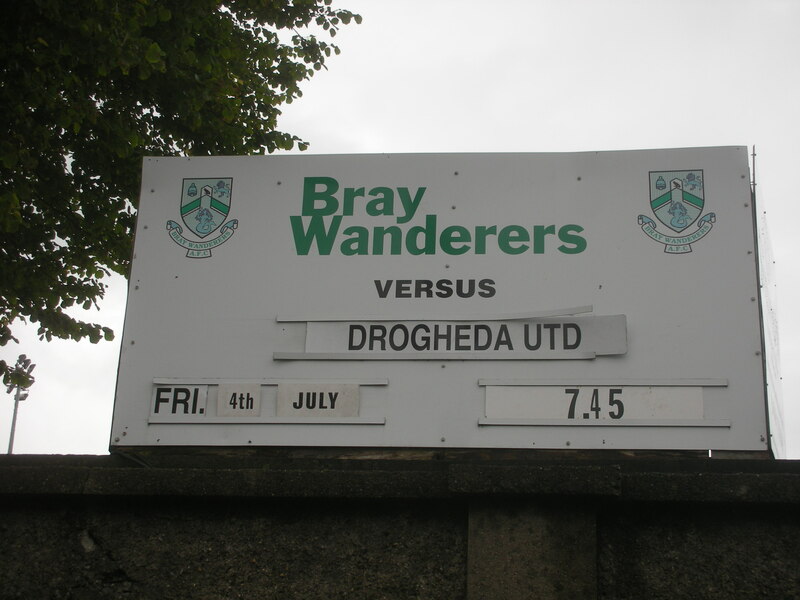 Today’s game sees Bray and visitors Drogheda United precariously positioned in the two places immediately above the dreaded drop zone currently occupied by UCD and Athlone. In truth though there was only one team in this game and the team from County Louth take the points thanks to two goals of extremely high quality from Gavin Holahan and Cathal Brady. The home sides task was not helped by the red card to Adam Mitchell for a needless challenge having already been booked in the opening moments of the game. 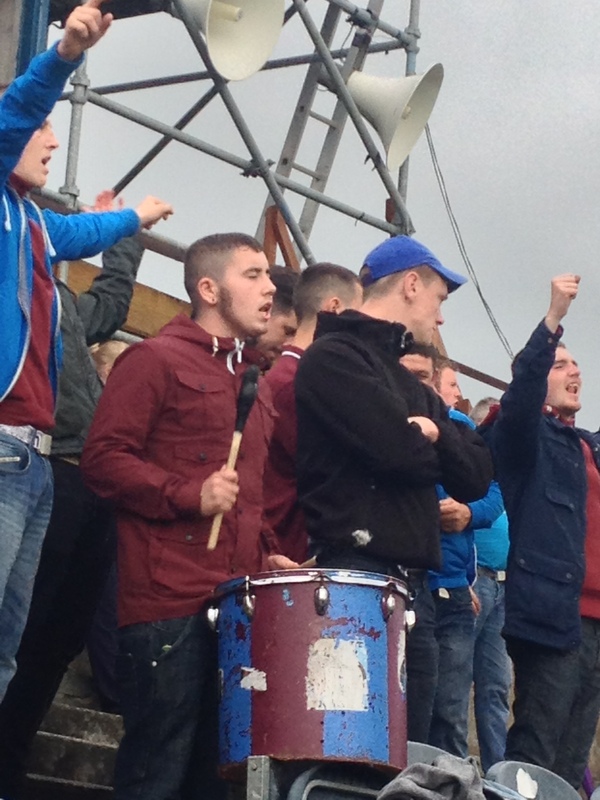 Drogheda are noisily supported from start to finish by a small band of ultras, the Famous45 Ultras, who have been involved in controversy recently when one of their flags was removed in a recent home game against Dundalk. The F45U subsequently boycotted home games. 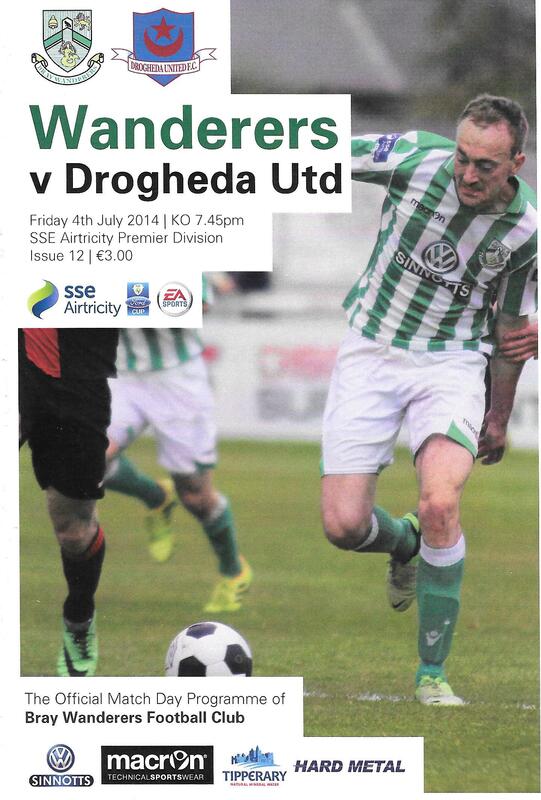 Bray’s own ultra group “Na Fánaithe” (The Rovers) sadly have precious little to cheer about tonight. 32. Stephen McGuiness; 24. Graham Kelly; 5. Adam Mitchell; 6. Eric McGill; 7. Shane O’Neill; 8. David Cassidy; 9. Ismahil Akinade; 11. Adam O’Hanlon; 15. Shane O’Connor; 16. Dean Zambra (c); 10. Jake Kelly. Subs: 1. Shane Redmond; 22. Robert Maloney (for 15,23 mins);18. 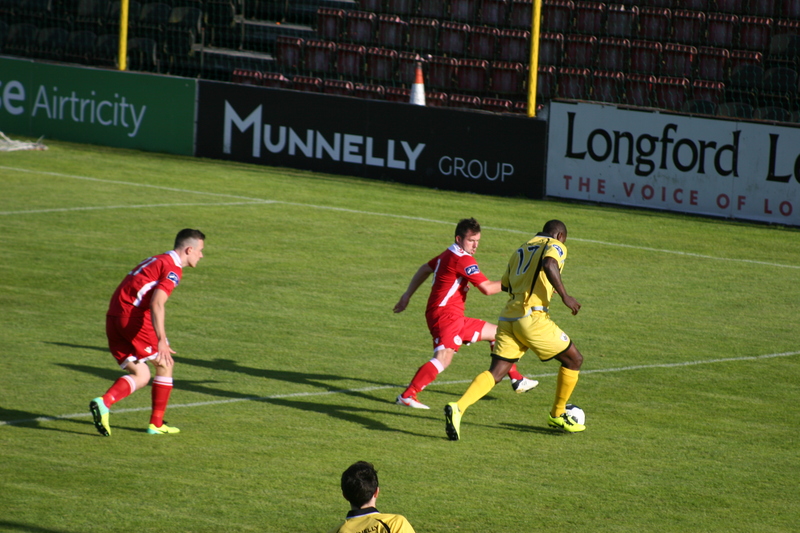 Ciaran Byrne (for 8,75 mins); 3. 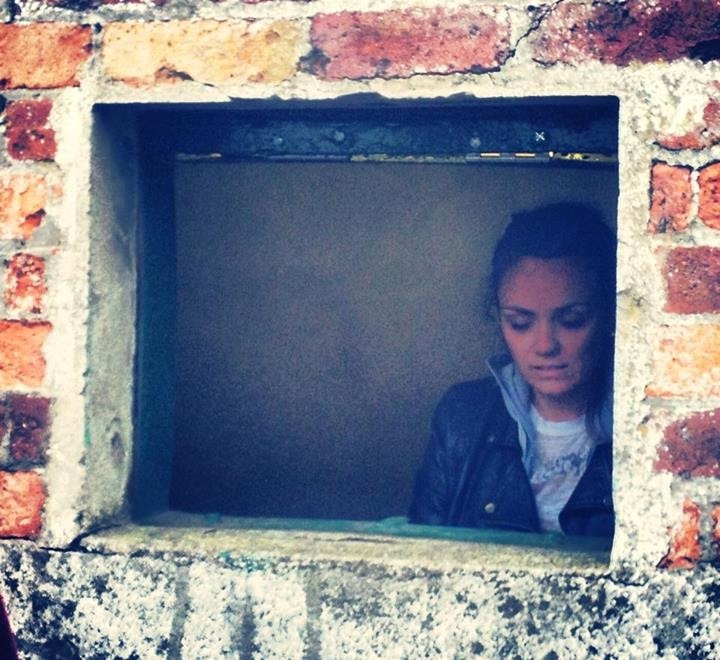 Jamie McGlynn; 19. David Scully (for 9,62 mins);17. Michael Browne; 21. Gary Curran. 16. Michael Schlingermann; 2. Michael Daly; 3. Shane Grimes (c); 5. Alan McNally; 7. Cathal Brady; 8. Gavin Holahan; 10. Gary O’Neill; 11. Gavin Brennan; 13. Stephen Maher; 14. Carl Walshe; 18. Daire Doyle. Subs: 40. Dylan Connolly (for 16,90 mins); 19. Declan O’Brien (for 10,85 mins); 6. Paul Crowley; 17. Sean O’Connor; 20. Dylam Harding; 22. Ciaran O’Connor; 24. Roy Kierans. 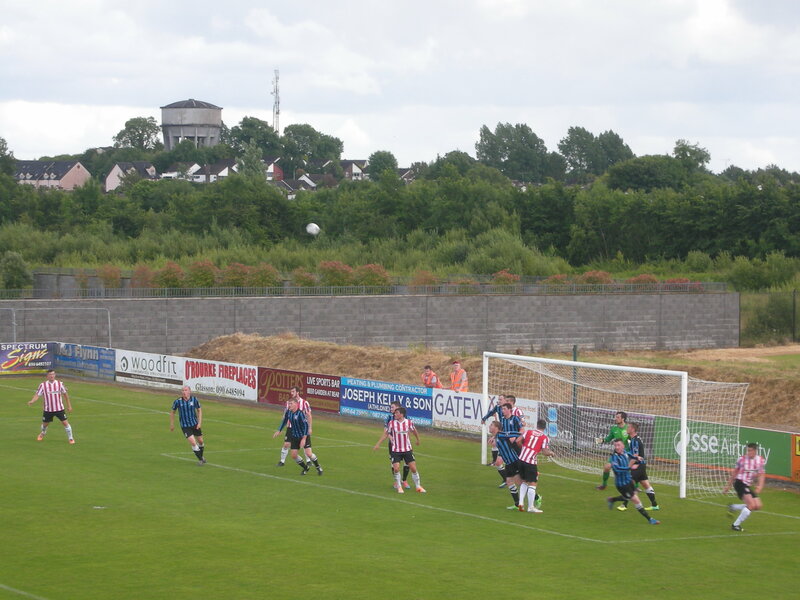 Football had been played at Brandywell since the 19th Century and had been home to the short lived Derry Celtic before the newly formed Derry City were offered a lease by Londonderry Corporation (now Derry County Council) upon their formation in May 1928. 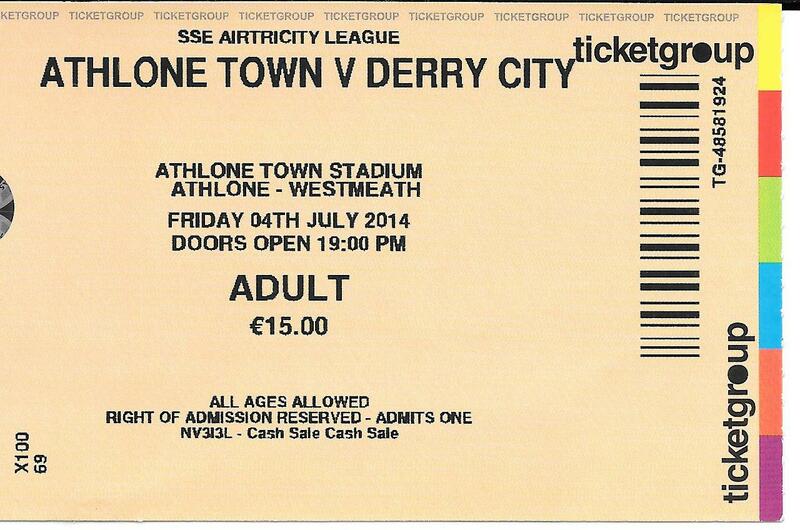 The club applied to join the Irish League but their application was rejected having arrived two days late. They reapplied the following season and were elected at the expense of Queen’s Island. The club initially wore claret and blue shirts but changed in the 1930’s to the fabled red and white candy stripes in homage to manager Billie Gillespie and his long association with Sheffield United. Years later Derry’s finest band, the Undertones, would replicate the candy stripes on the cover of their hit single “My Perfect Cousin”. 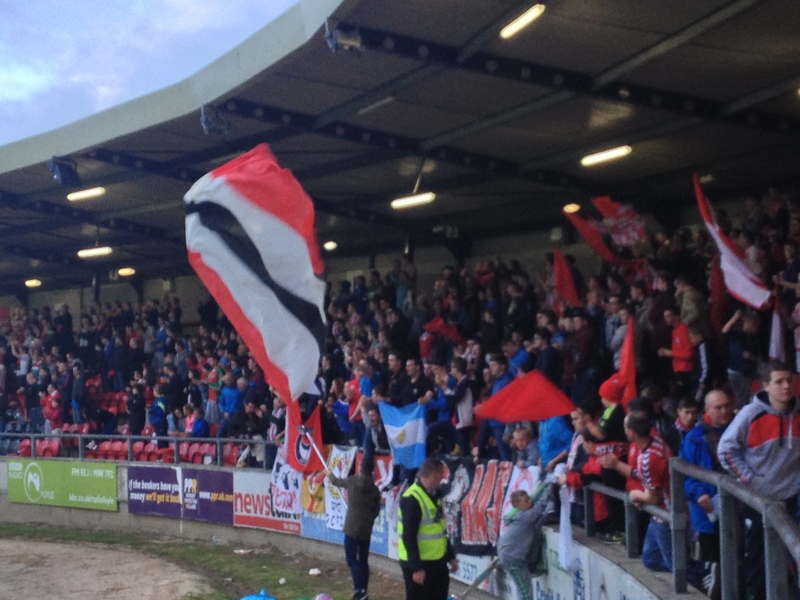 The club had issues with security of tenure at Brandywell and were constrained, as they still are, with a charter covenant from the Honourable Irish City which declares Brandywell should be “available for the free recreation of the local population”. In the early 1930’s the Derry City board discussed several options to move to their own ground but indecision let no less than three options slip through their hands. 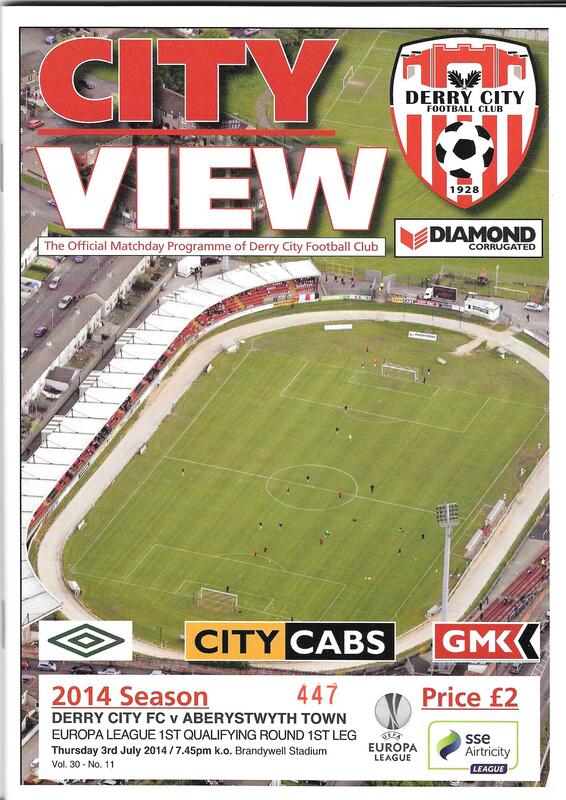 Option one was to buy Celtic Park, previously used by the defunct Derry Celtic and adjacent to Brandywell. 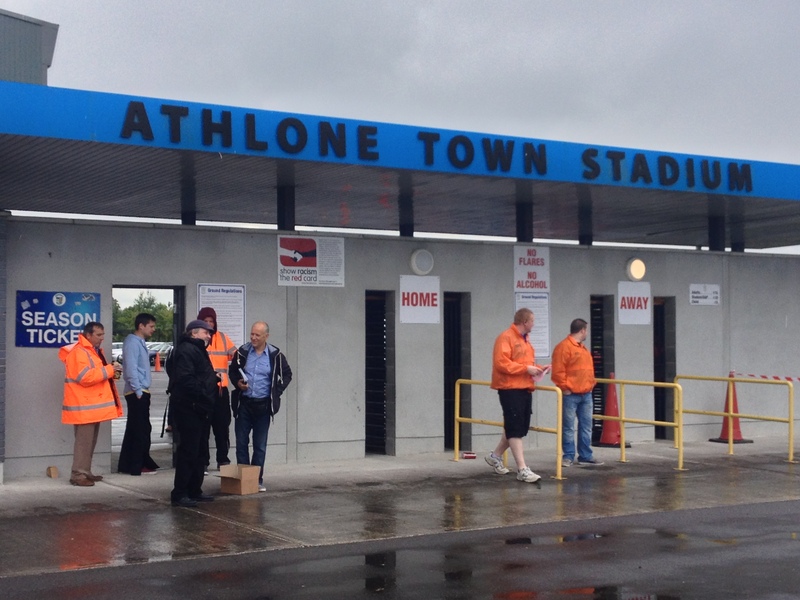 The club dithered and the local GAA club scooped up the option to buy the ground. The board were also offered Bond’s Field in Waterside but this was rejected as the board felt it was too far from their heartland of the Bogside. 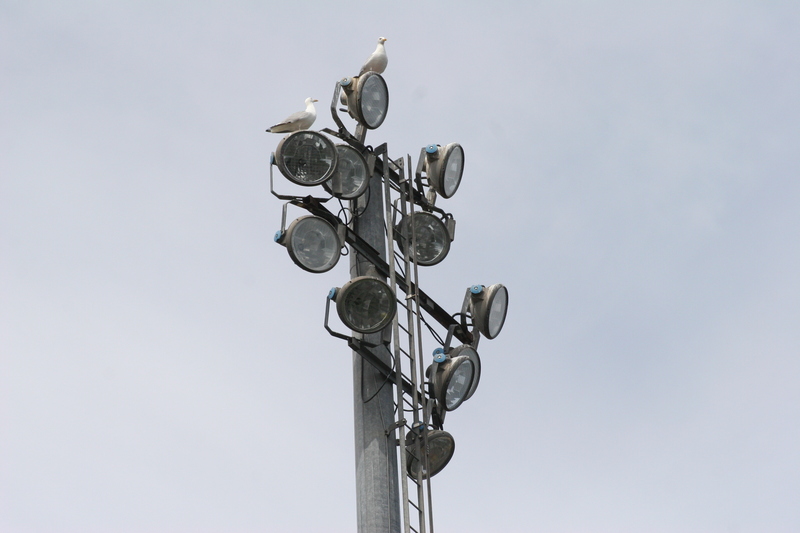 Finally they were offered Meenan Park for £1,500 but again decided to stay put. 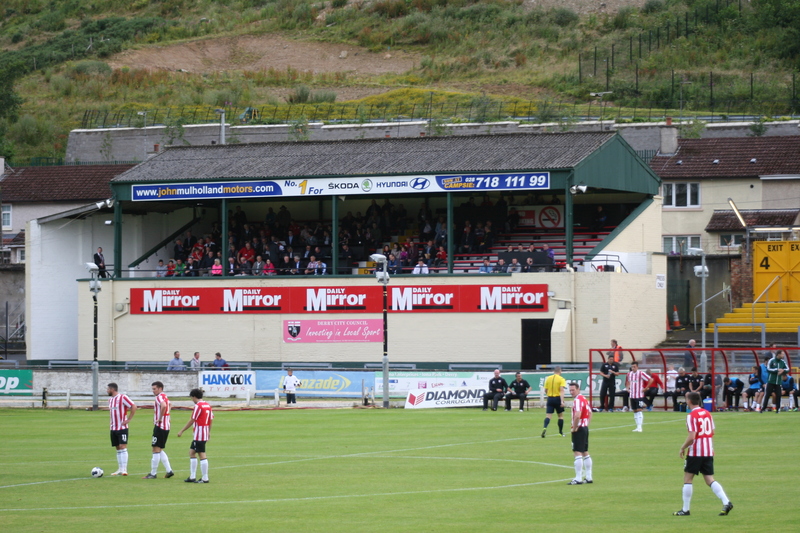 The club has played at Brandywell ever since despite a tempestuous relationship with the City Council. 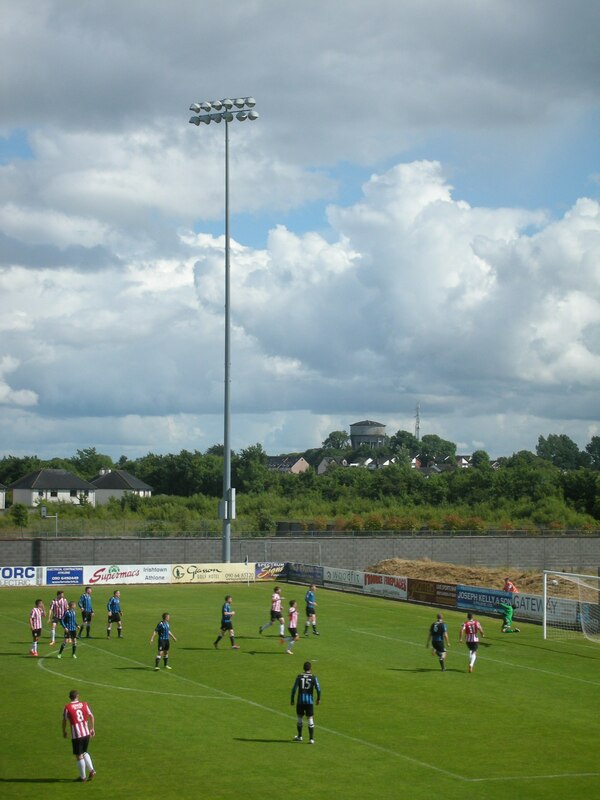 The present main stand sweeps around the ovoid greyhound track, present at the site since the 1940’s, and was erected in 1991 replacing the fabled “Jungle”. Opposite is an elderly raised wooden stand of uncertain heritage. 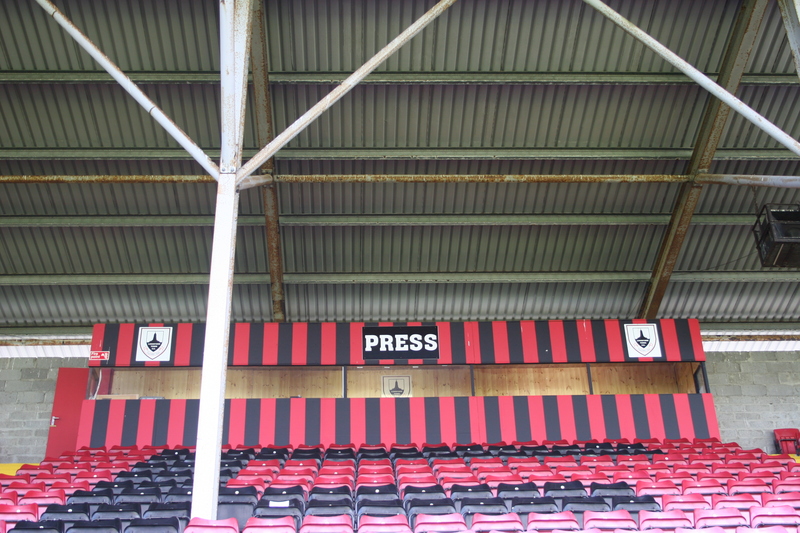 It’s known as the “Glentoran” stand having once stood at the Oval in Belfast and some even credit its modest construction to the legendary Archibald Leitch. This side of the ground is currently planned to be replaced with an all-seated stand which should once and for all end any issues around UEFA compliance. The Foylesiders won the Irish League for the only time in 1964/65 and in the following seasons European Cup competition they became the first Irish side to win a European tie accounting for FK Lynn Oslo over two legs. 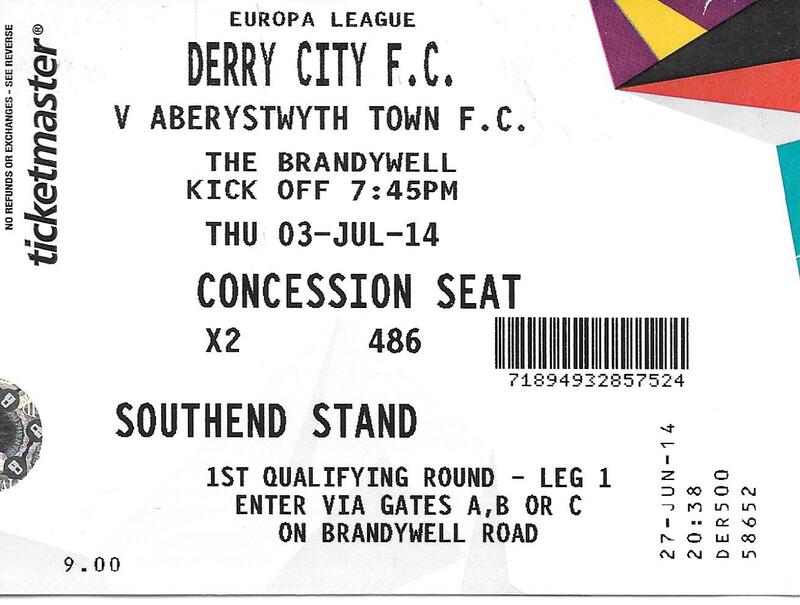 The Irish FA then said Derry could not host the second round tie against Anderlecht at Brandywell and would have to play it in Belfast. The club refused and the second leg was never played, albeit somewhat academic as the Belgians had won 9-0 in the home leg. Relations with the Irish FA would never recover and deteriorated so badly that the club were effectively booted out of the League in 1972. 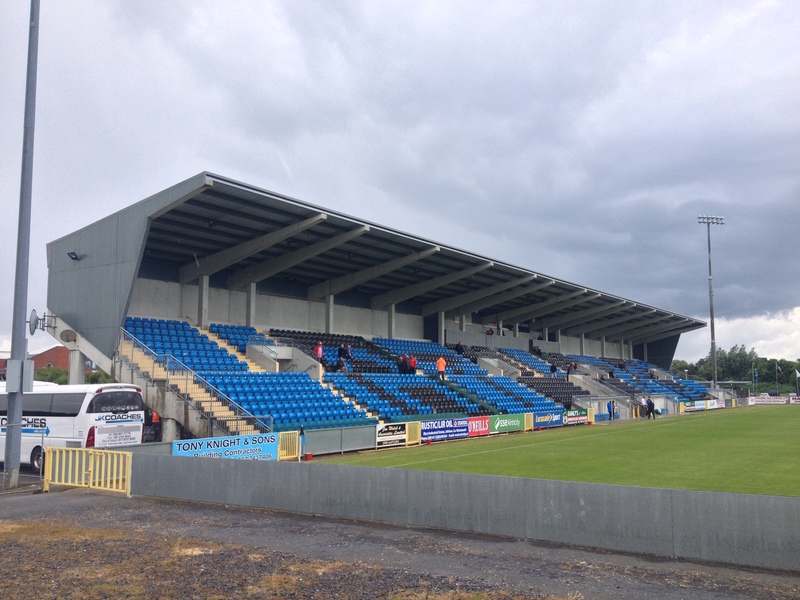 The Irish FA had said that due to the Troubles the safety of visiting teams could not be guaranteed and all home games had to be played 30 miles away in Coleraine. 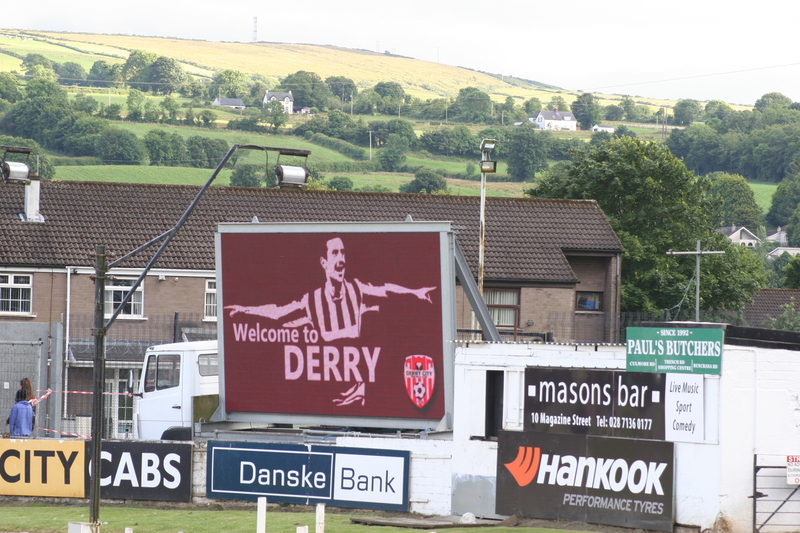 Derry’s crowds predictably plummeted and the club had no choice but to leave senior football altogether. City limped on in the Saturday Morning League and applied almost annually to rejoin the Irish League only to be rejected every time. 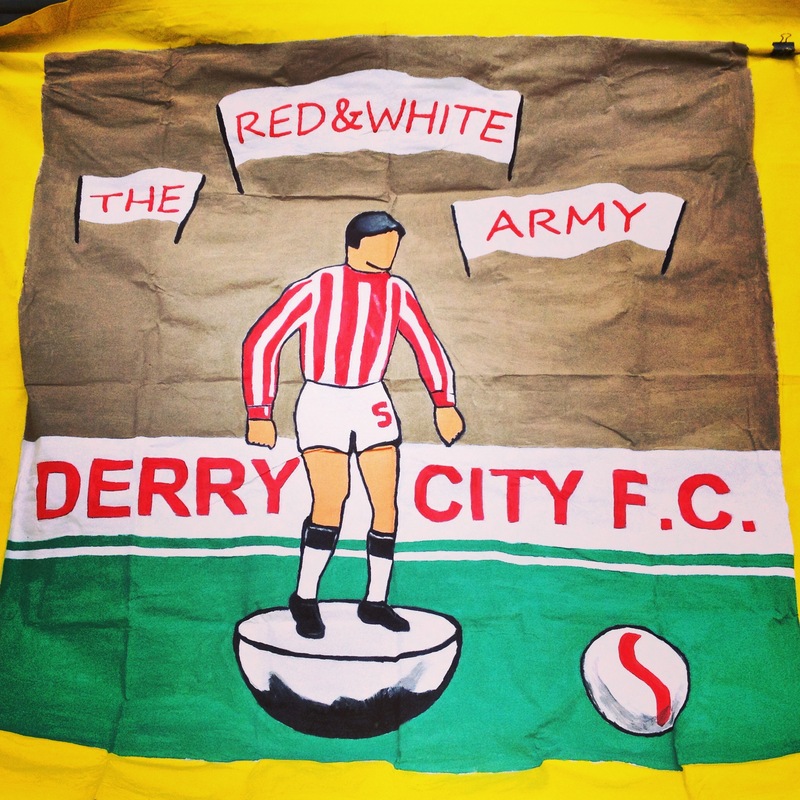 In 1985 an unlikely door swung open, boosted by a 4,000 crowd for a Derry v Shamrock match, the Irish FA met with their League of Ireland counterparts and unanimously agreed to let Derry transfer to the expanding Republic leagues. The club took to their new surroundings with relish they became the first club to win the League, the FAI Cup and the League Cup in the same season when they swept the board during 1988/89. While they have won the cups numerous times since the League Championship has returned to Brandywell only once, in 1996/97. 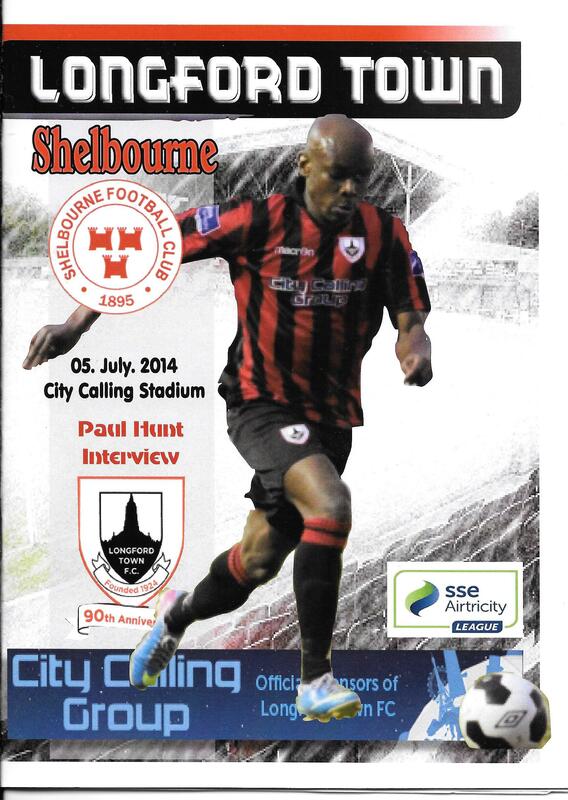 That said the club have been European regulars and tonight’s game is the opening leg of this season’s Europa League. Welsh club, Aberystwyth Town are made very welcome to the Brandywell with a Welsh flag fluttering in the gently Foyleside wind. 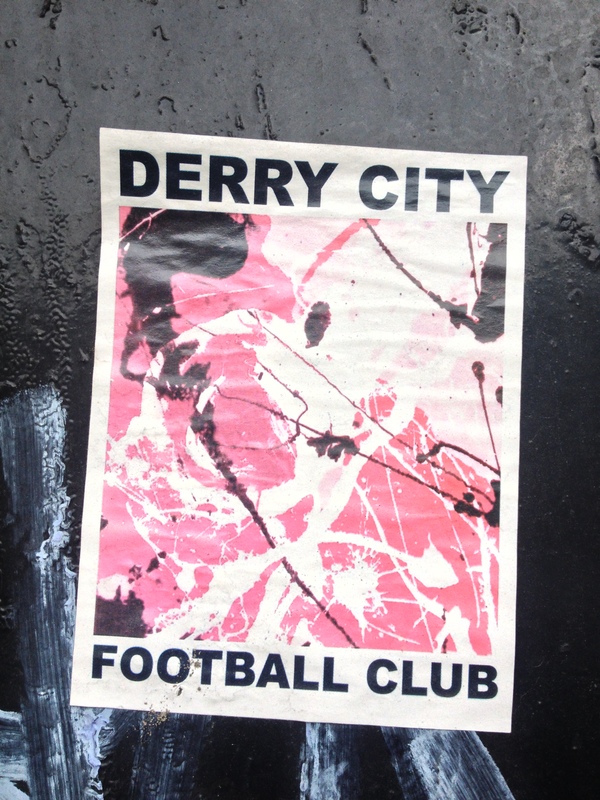 I had previously visited Derry in the 1990’s, although not to see a game. In those days I was ignorant but fascinated by the political murals and memorials but the somewhat notorious Bogside area was an intimidating place to be. Today there is no undertone of trouble and of a turbulent past, everyone is welcoming and just excited for the match and a promise of a bumper Brandywell crowd. Opening exchanges see the home side on top and just 15 minutes in Pat McEleney opens the scoring. Ten minutes later the turning point comes in the form of the Danish referee. Patterson burst into the visitor’s penalty box to be upended by keeper Mike Lewis. A clear penalty but the red card seemed a tad harsh. Patterson picked himself up and slotted home the penalty kick. 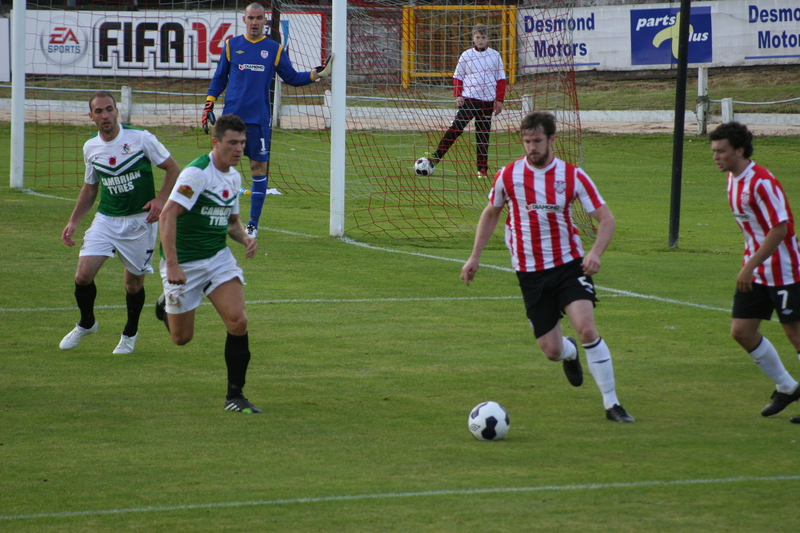 The Welsh side wilt visibly in the second half and Derry help themselves to two more courtesy of Timlin and McNamee. In truth but for profligate finishing, notably from Patterson, Derry could have clocked up double figures. A great venue with passionate support, what a terrific place to visit. 1. Gerard Doherty; 3. Dean Jarvis; 5. Ryan McBride; 26. Cliff Byrne (c); 30. Aaron Barry; 4. Barry Molloy; 7. Barry McNamee; 14. Michael Duffy; 19. Mark Timlin; 11. Rory Patterson; 10. Patrick McEleney. 1. Mike Lewis; 3. Cledan Davies; 4. Antonio Corbisiero; 5. Stuart Jones (c); 10. Chris Venables; 2. Chris Davis; 16. Wyn Thomas; 7. Geoff Kellaway; 8. Luke Sherborne; 9. Mark Jones; 11. Craig Williams.